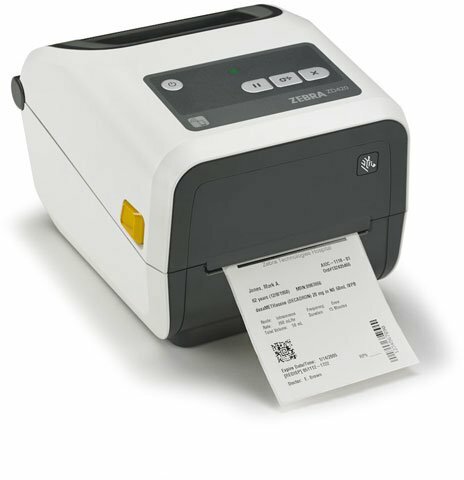 Zebra ZD420 Health care - Thermal transfer Printer, 4" Print width, 203 dpi, Health care Model, USB, Wi-Fi, Bluetooth 4.1, EPL/ZPL Printer Language. The easiest thermal transfer printer to load, period. The simplicity of the ZD420's ribbon cartridge takes the time and trouble out of replacing the printer ribbon. Regardless of experience level, end users can replace the ribbon and get back to work in seconds, with significantly fewer support calls to IT. 4.33" (110 mm) wide x 244' (74M) length, Wax Ribbon, ZD420 cartridge. 6-pack. 4.33" (110 mm) wide x 244' (74M) length, Wax-Resin Ribbon, ZD420 cartridge. 6 cartridge case. 4.33" (110 mm) wide x 244' (74M) length, Resin Ribbon, ZD420 cartridge. 6 cartridge case. The Zebra ZD42H42-C01W01EZ is also known as ZEB-ZD42H42C01W01EZ	or ZD42H42C01W01EZ	.